নির্বাহী সরকারের প্রশাসন কর্তৃক আদালতের রায় কার্যকরী না করা স্বাধীন বিচার বিভাগের পরাধীনতারই চরম বহিঃপ্রকাশ! Soon after the official results were announced I came to know from various reliable sources that after taking over power as the Prime Minister Sheikh Hasina will take the initiative to start the criminal proceedings by hook or crook against the leaders of 15th August and 7th November revolutionary uprisings to take revenge of his father’s demise and quench her blood thurst. Therefore, me along with few others had to come out from the country leaving behind our families. Immediately, after taking oath she moved a Bill in the parliament and annuled the Indemnity Act which was part of the 5th amendment of the constitution with just single majority in violation of the constitutation. As for any amendment in the constitution needed two third majority. When the Bill was passed Khaleda Zia and her Jote having sizable number of seats remained tight lipped and walked out of the house without any protest against this gross violation. ‘Silence is Consent’. So, Sheikh Hasina took the initiative to lodge an FIR in Dhanmandi Police Station through one Mr. Maidul Islam one of late Sheikh Mujib’s Personal Staff and started simple criminal proceedings of ‘Murder’ in the court of her appointee Golam Rasul. 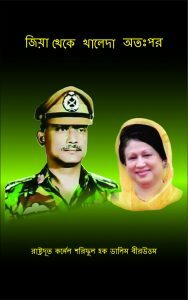 In that trial accused were President Khandakar Mushtaq Ahmed, Gen. Ziaur Rahman, Taheruddin Thakur, Ex Minister Shah Moazzem Hossain, Mr. K.M. Obaidur Rahman including all the top leaders of the revolutionary uprisings who were in the country and serving abroad as diplomats and a few JCOs, NCOs and soldiers and caders of Sena Parisad. Arrest warrents were issued against all. Alongside another GD was filed with Lal Bagh police station and trial of ‘Jail Killing’ had also been initiated. In that trial all the top revolutionary leaders of 15th August and 7th November were made accused alongwith President Mushtaq and Gen. Zia in that case as well. Later the names of President Mushtaq and Gen. Zia were struck off from the list of the accuseds considering them as dead persons. Shekh Hasina’s government managed to issue red alert against all the accuseds through Interpol in an lightning speed. Everything was happening in an unprecidented speed! As the Bill was passed with single majority and trial proceedings of these two cases started in a haist some ligal complications emerged. As any officer or soldier in active service gets involved in any armed revolt or uprising has to be tried in a court martial under Army Acts and Rules not in a civil court. To eradicate this impediment another hinious step was taken by the Prime Minister Sheikh Hasina. She brought back her Uncle(Fupa)Mustafiz Rahman, a retired officer from corps of Engineers and promoting him to the rank of Genarel installed him as the Army Chief on contract basis. He in return issued an odacious and quire surmon violating Army Acts and Rules that AHQ will have no objection if the serving officers and soldiers associated with ‘Sheik Mujib’s killing’ and ‘Jail Killing’ are tried in a civil court. Thus, she thought such an illegal surmon issued from the AHQ was good enough to remove the legal hurdle on the way to proceed with the trial in a civil court! On the day of election by afternoon anticipating the defeat of BNP led Jote Maj. Huda returned to Dhaka and the same night he reached at Bangkok on way to Australia. I contacted Huda and had said Bangkok was not a safe place for him at all so he must leave Bangkok as quickly as possible. In reply Huda said he has something to do and would leave Bangkok immediately after that is done. As Huda reached Bangkok the then pro BNP Ambassador Julmat Ali Khan invited Huda at his residence. As a popular Member of Parliament Huda was a known face to many people. Most probably his presence in Bangkok was licked out from his visit at the Ambassador’s residence. For some unknown reason his departure from Bangkok was fatefully delayed. Meanwhile, the Embassy officials and staffs had started shadowing him. On a rainy day he was apprehended from a shop through a stage managed drama. Nothing is impossible at a place like Bangkok if money is spent. The day was Friday and then were weekly holidays Saturday and Sunday so, Huda had to remain interned at a Police Station. On Monday he returned at the hotel and learned his passport was seized by one influential officer Col.Hanif Iqbal(An Ex- Rakkhi Bahini Officer) then posted at the Bangladesh Embassy. As part of the drama police arrived at the hotel and wanted to see his passport. As he did not have the passport police took Huda in custody and decided to keep him in the detention center. But Col. Hanif after receiving instruction from the Prime Minister became over enthusiastic and started exerting pressure on the police to hand over Huda to him. But due to legal implication Bangkok police authority decided to send Hua to the detention center. Huda’s younger sister was then at Harare the capital of Zimbabuwe. After failing to know anything about Huda’s whereabout the frightened sister sent an frantic e-mail to the Red Cross. Promptly Red Cross office in Bangkok forwarded that mail to UNHCR at Bangkok. Thus as the UNHCR got involved Hasina’s government inspite of exerting all their mights failed to take back Huda to Bangladesh more than two and half years. Later Bangladesh government signed an Extradition Treaty with Thai government in a haist and only then Huda could be extradited to Bangladesh. We all were sadden with this unfortunate plight of a fellow revolutionary comrade Maj. Huda but were undone to do anything but to morn. Decision was taken that all those were still serving as diplomats abroad must arrange on priority basis a safe refuge of their own convenience before they are recalled. It was also decided that to avoid any suspition all should remain normal discharging their day to day responsibilities so that no hinerence is created in executing their plan and when the recall orders are issued all will pretend that they are proceeding to Bangladesh but on the way will proceed to their chosen destinations. The unfortunate plight was convyed to all others. It was not possible for Maj. Huda to get out from Bangkok as he got entrapped in the net layed by RAW and Hasina’s government. Col. Faruk, Col. Shahriar, Col. Mohiuddin(Who had released Gen. Zia from custody after successful solders and people’s revolution of 7th November) and many others were illegally thrown into condemned cells. Maj. Huda was similarly thrown into condemned cell after repatriation. According to Jail Code, only the convicts with death punishment are kept in the condemned cells. The higher court though refused their bail petitions had granted class as political prisoners. But the concerned administrative authority and Jail authority refrained from implementing that court order to save themselves from the wreath of the Prime Minister Sheikh Hasina. An unique menifestaion of subservience of proclaimed independent Judiciary!